Eighteen-year-old Allie lives in the small village of Pacific Coast with her parents and twin brother, Andrew. Her mom works for the wealthiest family in town, and her dad, now retired from the Army, is trying to build his mechanic’s business. Allie’s family has moved numerous times due to her father’s different transfers, but now that he has retired, they return to Allie’s mom’s hometown. Allie loves the small coastal town and fondly remembers the summers she has spent there with her grandmother and her best friend, Blake. When Allie’s family settles permanently in town, Allie learns Blake has gotten into some trouble and is in a juvenile home. Trip Phillips, son of Allie’s mom’s boss, and the most popular boy in school, decides to make Allie his girlfriend. At first, she can’t understand what he sees in her or why he would dump the glamorous Hannah for her, but she is overjoyed. At first. Trip proves to be overly possessive. Not only that, but he has a volatile demeanor with moods that change without warning. After several months, Blake returns to Pacific Coast to live with his grandmother, but Allie ignores him. Trip has made it known that Allie belongs to him, and she doesn’t want to upset her boyfriend. Then when Allie attends the Cotillion, one of the town’s biggest celebrations, she is upset that Trip doesn’t want to go party with the rest of the kids afterward. He informs everyone he wants to be alone with Allie to give her a special gift for her 18th birthday. They leave the dance and everything that happens after that becomes a blur to Allie. The next thing she knows, she awakens at the hospital after being found on the side of the road, presumably tossed out of Trip’s truck before it careened over the side of a cliff and into the ocean where it was swept away. The truck and Trip’s body have never been recovered. Then she starts receiving ominous notes in Trip’s handwriting. What really happened between Allie and Trip? What caused the accident that killed him and permanently scarred Allie? And who is sending Allie the notes? 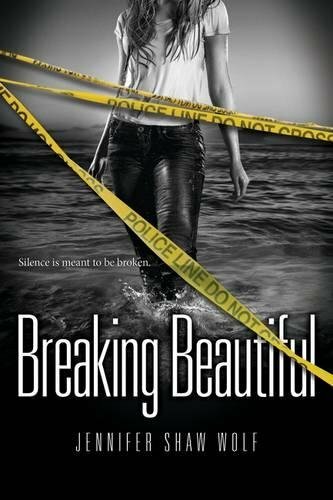 Breaking Beautiful is a well-written, fast-paced debut novel capturing teenage emotions while dealing with the delicate subject of abuse. A captivating novel. A must read for young adults as well as their parents.